In true spring fashion, it's started raining. Thankfully not when these photos were taken or I would have had to swap out the faux suede trench for the actual waterproof coat, but it's pretty grey and soggy out at the moment. It's funny to think of spring as being a rainy season here, because our precipitation amounts average to be pretty much the same all year (thanks for the info, weather.com). Of course my favorite signifier that spring is coming is the start of my tulips. I have neither much patience nor talent when it comes to gardening, but when I see the beginnings of my tulips cropping back up each year, I feel such a sense of pride. I'll I did was dig a hole, and they take care of the rest, but I will take all the credit, thanks! Much to my surprise, yesterday I held myself to doing a small closet clean out, and pulled over two dozen things to consign or donate. I know I could do more, I didn't even attempt time consuming areas like the lingerie drawer or my massive jewelry collection, but I took care where it was needed the most. I liberated some hangers, my denim is once again neat and orderly, and for the time being, I'm completely ignoring the rubbermaid bin of summer clothes. I hate to admit to the number of things I hold on to for sentimental reasons. The Desigual skirt I bought in Italy, a unique thrifted tee from a short-lived Australian designer, and a vintage canvas and leather bag are a few that I know I haven't worn or carried in at least four years (!) but I don't want to let them go. I've often said I wished I had my own vintage shop, but honestly I think it would be hard for me to want to sell anything! When I find those unique items, it always pains me to let them go, even when they are no longer something I reach for when getting dressed. Are you good about purging, or do you fall victim to wanting to hold on to things for nostalgia? I love this classic outfit! 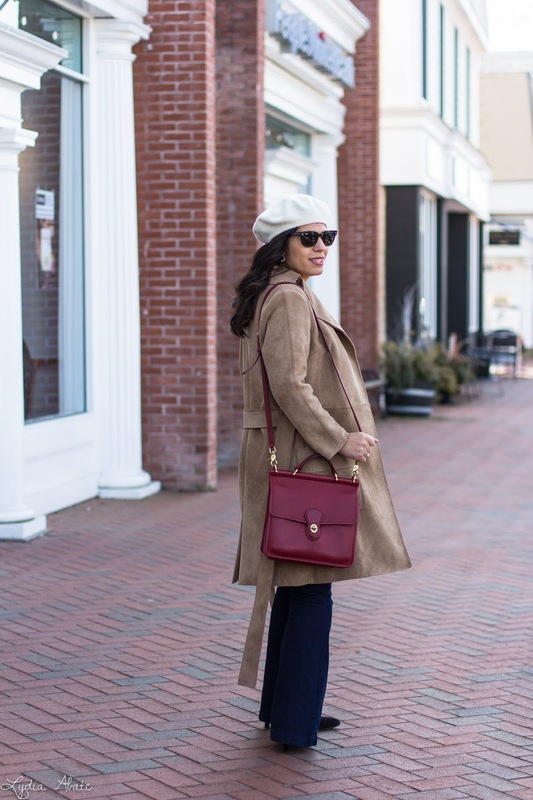 The coat and beret are perfect finishing touches. Also love the pop of red! Such a good outfit - I love that jacket! 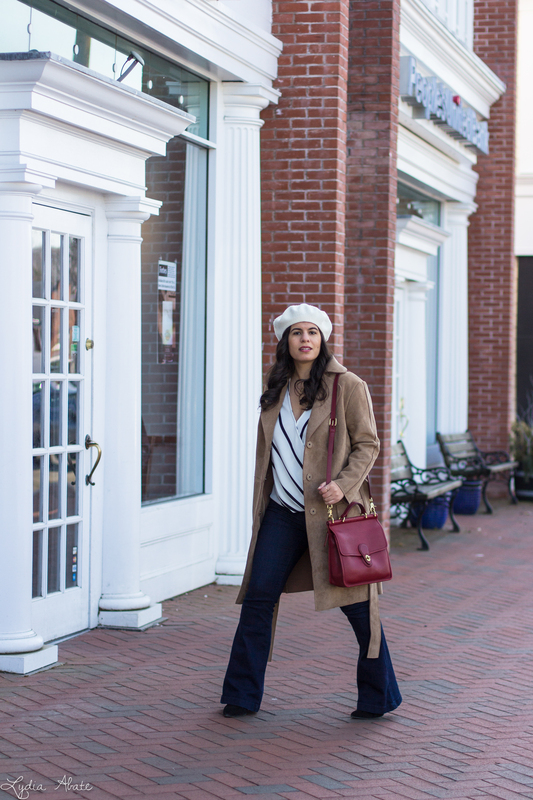 The coat and striped shirt work well as the Coach bag. Whenever I see a beret so very well worn I can only ask myself why I cannot make it happen for me. On the closet edition front I can say I too hold on to things for sentimental reasons... eventually you'll let go of them. I used to be much better about purging. I don't know what's happened...ugh! But I am trying to only keep pieces that are good colors for me...at least my tops and jackets. I've gotten rid of a ton of black. I wish it was easier (and by easier I mean I'm lasy...ha ha) to sell our stuff too. That would make it much easier for me, I think. Love that coat!! And I'm horrible at getting rid of things too. You HAD to keep that skirt, full of travel memories. That coat is gorgeous! I'm usually pretty good about purging (I find it really cathartic to do a big purge once or twice a year and I can usually be pretty mercenary about it). 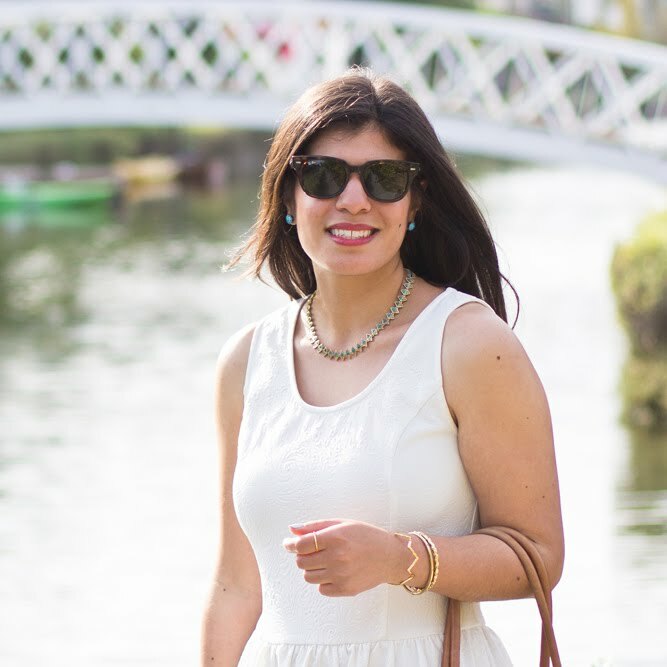 What I have noticed, however, is that over the last few years I've been reluctant to get rid of things that I haven't worn since Eleanor was born because I'm still clinging to the idea that, one day, my body 100% will return to its pre-pregnancy state. I hate that I'm doing that because the reality is that it's changed forever (not in a negative way or anything, but it's absolutely different) and I need to start embracing that and celebrating it a bit more, rather than being nostalgic and allowing that to prevent me from a full closet purge. love that this has a bit of a Parisian vibe! This is such a classic and chic look! I feel like you get so much wear out of this coat. I am really loving those jeans. They fit so well. Also, aren't closet clean outs so cathartic? Like a weight has been lifted. I am so bad at decluttering - I have emotional attachments and keep things 'just in case', it's so hard to downsize my wardrobe especially, so I am focusing on shopping less! I'm doing better with getting rid of baby stuff we no longer want and just general stuff around the house, I hope eventually that skill extends to my wardrobe, ha! Tulips are my favorite flower! I want to see yours blooming! 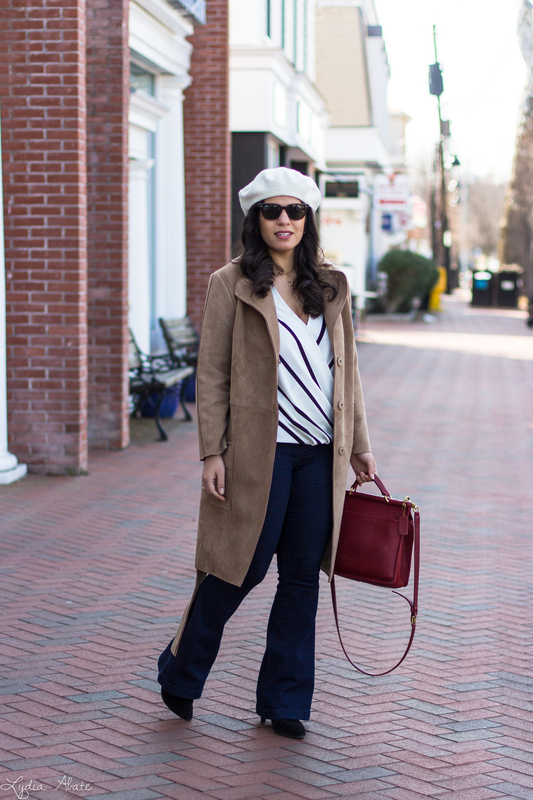 Love this transitional winter-to-spring outfit. That beret is so cute on you! I tend to purge my closet/ accessories quite frequently! Love the look, the suede jacket is so classy! 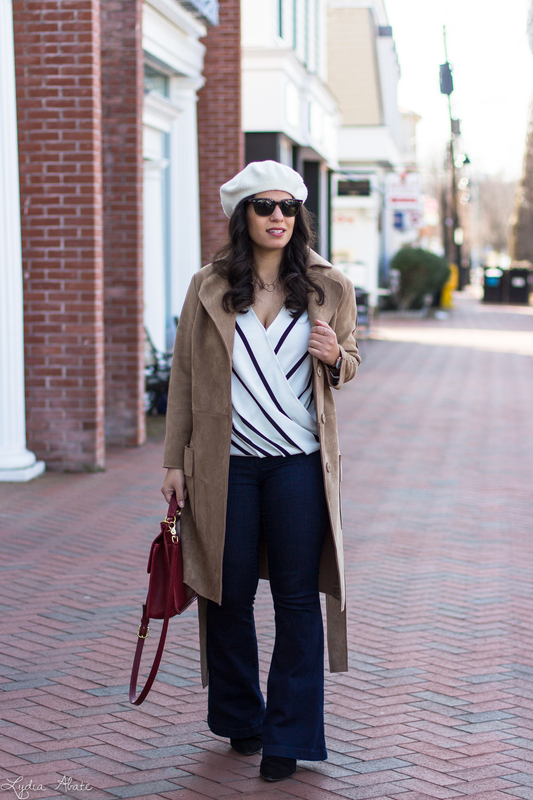 The bag and hat make this outfit! It is so cute on you! I'm not quite sure which I am because in the past couple years I've been actively purging things in my closet every 2 months. At the same time, I for sure hold on to items that have sentimental and nostalgia to it. That trench coat of yours though is so gorgeous! 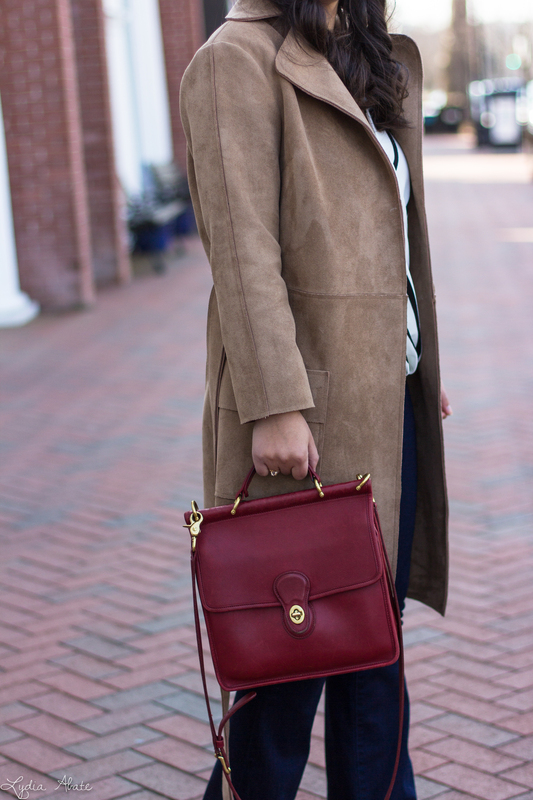 I've been on a hunt for a suede coat! That handbag is SO chic! It looks amazing with this look lady! I have a few sentimental items that I tend to hang on to until they no longer seem sentimental (if that makes sense). Sometimes I revisit them and wonder why I keep it. Other times I know it will never leave my closet! Good for you for getting rid of so many things! I just donated 5 items and felt accomplished! Ha!